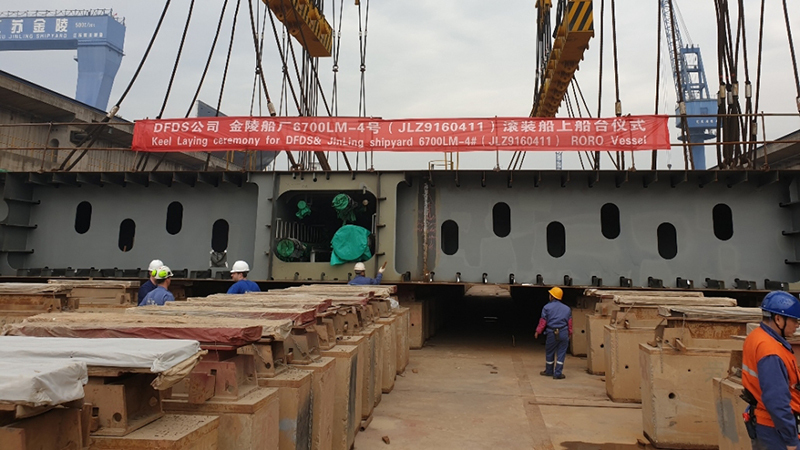 The third DFDS freight ferry from China had not been outside the dry dock for long before the site team and construction crew started the construction of our fourth newbuilding. March 27, the traditional keel-laying ceremony took place at the Jinling Shipyard to officially celebrate the start of construction of the fourth DFDS freight ferry. In line with Chinese tradition, a coin was placed under the keel and this time Chief Engineer Matti Thomsen was given the honour of sealing it as a symbol of luck throughout the construction process and while at sea. The fourth freight ferry is expected to be delivered in the last quarter of 2019.